Students review what they know about the continents and oceans. Then they learn additional information about both. Next, they explore the differences between weather and climate and look at the climate zones throughout the world. Finally, students work in groups to learn about climate-related topics and report back to the rest of the class. 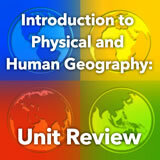 In this experience, students review what they know about the continents and oceans. Then they learn additional information about both. 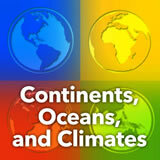 Next, they explore the differences between weather and climate and look at the climate zones throughout the world. Finally, students work in groups to learn about climate-related topics and report back to the rest of the class. In scene 4, students will work in small groups, each with a different task. 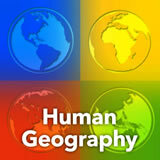 Identify and describe Earth’s continents and oceans. 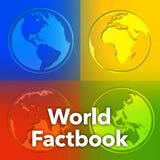 Describe the various climates of Earth. In this experience, you’re going to learn more about the earth’s continents, oceans, and climates. But first, let’s review what you already know! 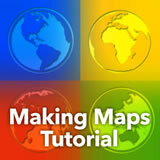 Use the text tool to label on the map below as many of the continents and oceans as you can. If you can’t name them all, don’t worry. You will be learning about them in this experience. When you are finished, discuss with your class what you know and don’t know. As a class, set some goals about what you’d like to learn. The Complete List of Learning Experiences in Studying Geography Unit. Would you like to preview the rest of this learning experience, and get access to the entire functioning World Cultures MS course for your classroom? Sign up using your school email address below.